Organizations require the WAN to provide sufficient performance and reliability for the remote-site users to be effective in supporting the business. Although most of the applications and services that the remote-site worker uses are centrally located, the WAN design must provide the workforce with a common resource-access experience, regardless of location. Carrier-based MPLS service is not always available or cost-effective for an organization to use exclusively for remote-site WAN connectivity. There are multiple WAN transport offerings that can be used simultaneously to create a robust, secure, and cost-effective WAN, including MPLS VPNs, Internet, Cellular (3G/LTE), and Carrier Ethernet. Internet-based IP VPNs offer attractive bandwidth pricing and can augment premium MPLS offerings or replace MPLS in some scenarios. 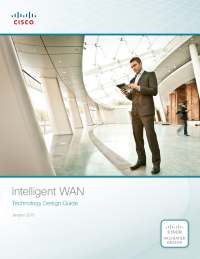 A flexible network architecture should include all common WAN transport offerings as options without significantly increasing the complexity of the overall design.